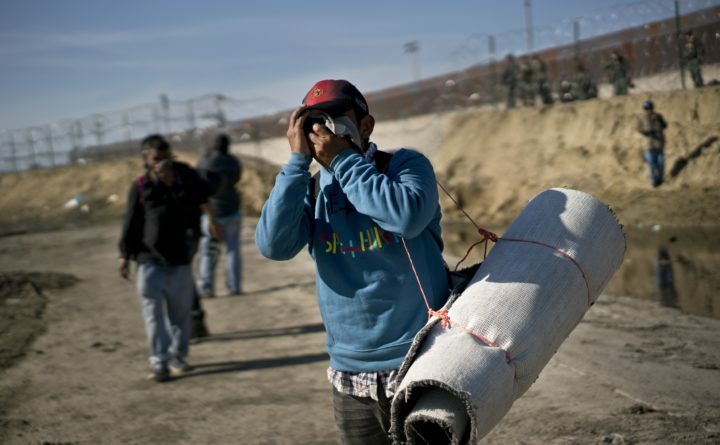 A migrant carrying a roll of carpet wipes his face after U.S. border agents fired tear gas at a group of migrants who had pushed past Mexican police at the Chaparral border crossing in Tijuana, Mexico, Sunday, Nov. 25, 2018. The mayor of Tijuana has declared a humanitarian crisis in his border city and says that he has asked the United Nations for aid to deal with the approximately 5,000 Central American migrants who have arrived in the city. Military recruits enter the chamber one by one and don protective masks. Tear gas swirls. Then, the order: Take off your mask and breathe. Eyes well and throats tighten, and men and women training for war uncontrollably gag. Nearly every uniform is coated in snot. Some recruits vomit. The gas chamber exercise demonstrates to troops that their equipment works. It also shows, in a visceral way, what happens if an enemy targets U.S. forces with an agent like tear gas, commonly known as CS gas — an aerosol compound considered a chemical weapon that has been outlawed on the battlefield by nearly every nation on Earth, including the United States. But as a riot control agent, 2-chlorobenzalmalononitrile is legal to use by both police and federal authorities in the United States and many other countries. On Sunday, U.S. Customs and Border Patrol agents fired the chemical agent at mostly Honduran migrants attempting to cross at Tijuana — an unusual escalation of lobbing weapons over an international border at unarmed civilians seeking refuge, drawing condemnation from Democrats. “I felt that my face was burning, and my baby fainted. I ran for my life and that of my children,” Cindy Milla, a Honduran migrant with two children, told the Wall Street Journal. Chief Patrol Agent Rodney Scott, the senior Border Patrol agent for the San Diego area, defended the use of the gas, telling CNN that three of his personnel were struck by rocks or debris that also “dented” vehicles. None of his agents were seriously injured, he said. Chemical weapons such as CS gas are indiscriminate and “uniquely terrorizing in their application,” which necessitated their ban in combat in 1993, said Kelsey Davenport, director of nonproliferation policy at the Washington-based Arms Control Association. Once launched in a volley or thrown into an area, chemical weapons cannot be controlled and can drift toward people who are not targets, Davenport told The Washington Post on Monday. In battle, that would include civilians and wounded troops, and even friendly soldiers if the winds shift. U.S. battle planners in World War I accounted for U.S. casualties from its own asphyxiating gas attacks. On the border Sunday, women and children, some in diapers, came into contact with tear gas, raising questions about whether it was a proportional response. Officials described aggressive men threatening the safety of agents; Scott said 42 people, mostly men, were apprehended on the U.S. side of the border. A CBP spokesperson did not return a request for comment on agency policies for when it is appropriate to use CS gas, or concerns about firing over the border, or how many rounds were fired. No serious injuries of migrants were reported. Images of children and mothers fleeing from tear gas outraged Democrats critical of President Trump’s response to the migrant caravan. Gavin Newsom, the Democratic governor-elect of California, argued that images of kids sprinting from tear gas run counter to American ideals. Tear gas was used during protests in Ferguson, Missouri, after the 2014 police shooting death of Michael Brown, drawing similar rebukes from rights groups and citizens who said the police response was disproportionate. Middle Eastern and African countries typically use CS gas more potent than what U.S. authorities wield — with devastating results. In 2013, Egyptian police fired tear gas into the back of a vehicle carrying supporters of ousted president Mohamed Morsi to prison, asphyxiating and killing 37 people. An attorney for the men posted photos of one corpse on Twitter with a face so darkened that families believed at first that the victims burned to death. Other people have been killed by inhaling CS gas or by the projectiles themselves. The first of subsequent chemical weapons ban occurred after World War I, Davenport said, after the international community was shocked by twisted corpses in the trenches and horrific wounds of troops who survived with blistered skin and scarred lungs. In the modern era, the use of chemical weapons by Saddam Hussein in war and against Iraqi civilians was a factor to push for a total ban of chemical agents, Davenport said. The 1993 Chemical Weapons Convention banned not only the use of chemical weapons in war but also the production and stockpiling of weapons for 193 signatories, she said. Israel has signed but not ratified the convention. North Korea, Egypt and South Sudan have not taken action.